This handsome flowering heath (previously known as Styphelia pulchella) at first glance looks very much like one of the Beard-heaths from the genus Leucopogon, but the anthers of Leucopogon are largely hidden in the throat of the flower, whereas in Styphelia the anthers are well exposed. 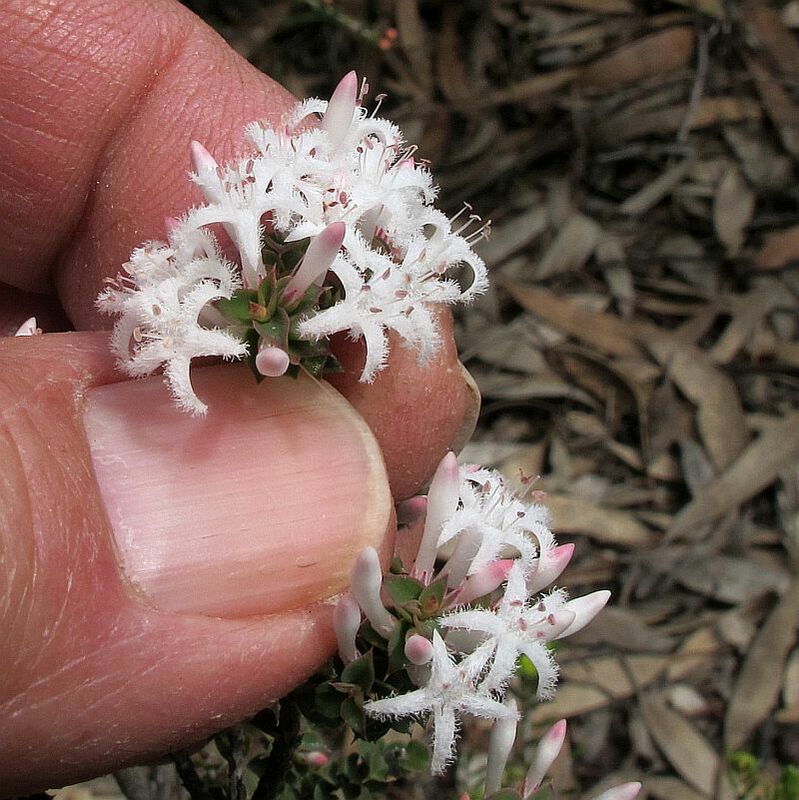 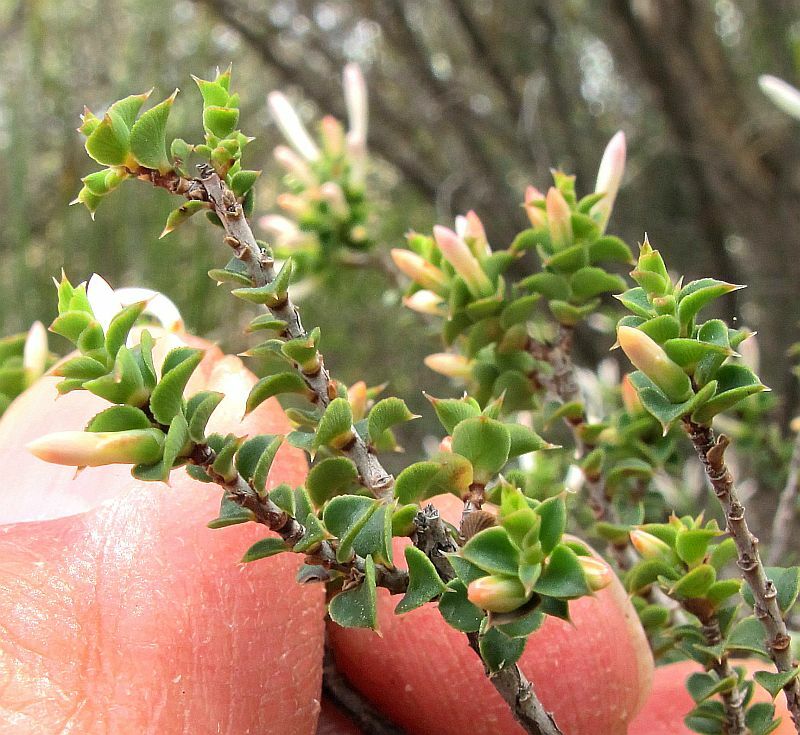 I have only encountered this plant to the NE of Esperance, probably due its preference for alkaline soils that are more common in this region. 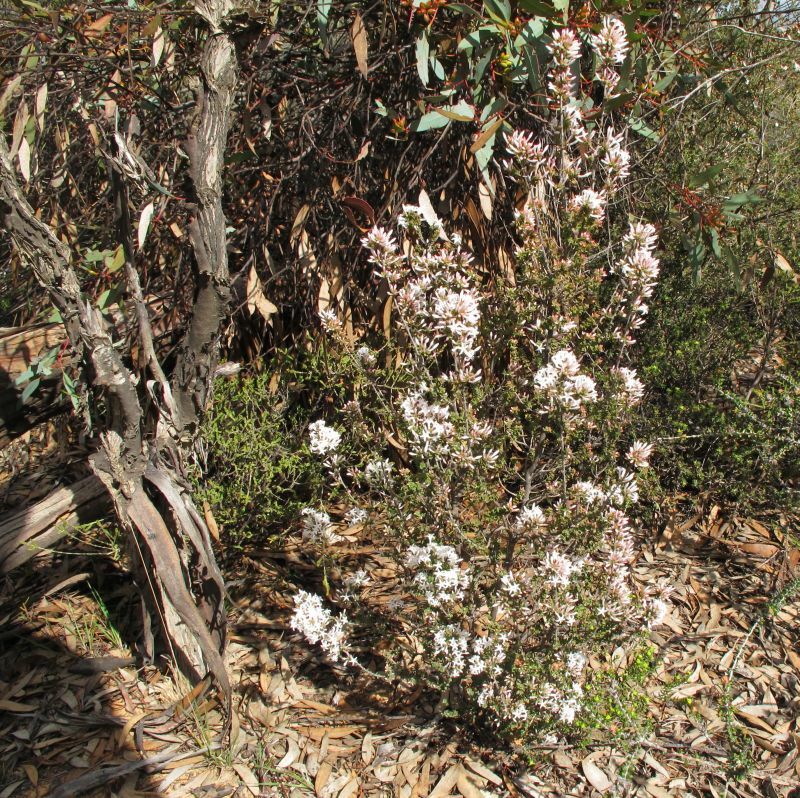 Styphelia exserta is an open upright shrub growing to less than a metre (2’-3’) in height. 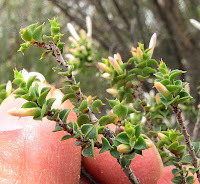 The minor branches are clothed with small-recurved leaves, which due to their size are far less prickly than they appear to be in the photographs. 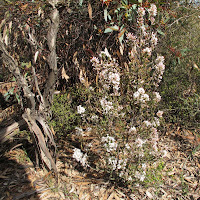 When flattened, the leaves are broadly ovate with scalloped edges, fine striations on top and pronounced ribbing on the underside. 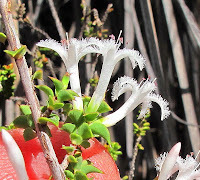 The base of the leaves embrace not only the flower, but the stem also, whilst the tip sports a sharp rigid point, but as the leaves are only 3-4 mm (1/8”) in length, they are only of serious concern to damaging insects. 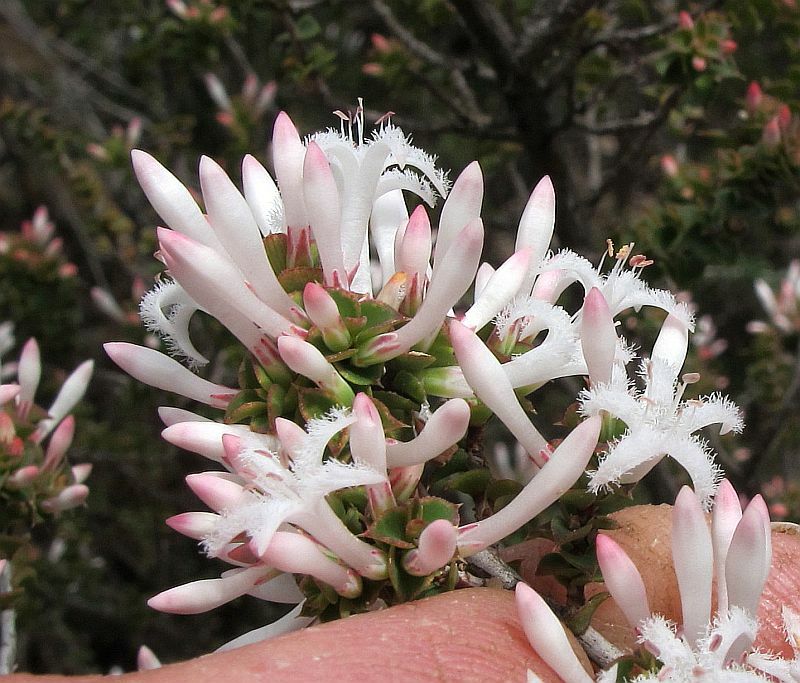 The flowers are a little over 1 cm (nearly ½”) in length and clustered towards to ends of branches, each nestled into an embracing and protective leaf to give the impression of terminal clusters of vivid white flower spikes and only when in bud (flushed pink) can this arrangement be clearly seen. 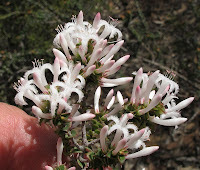 As in this instance, most Australian heaths require a second look to appreciate their intricate beauty. 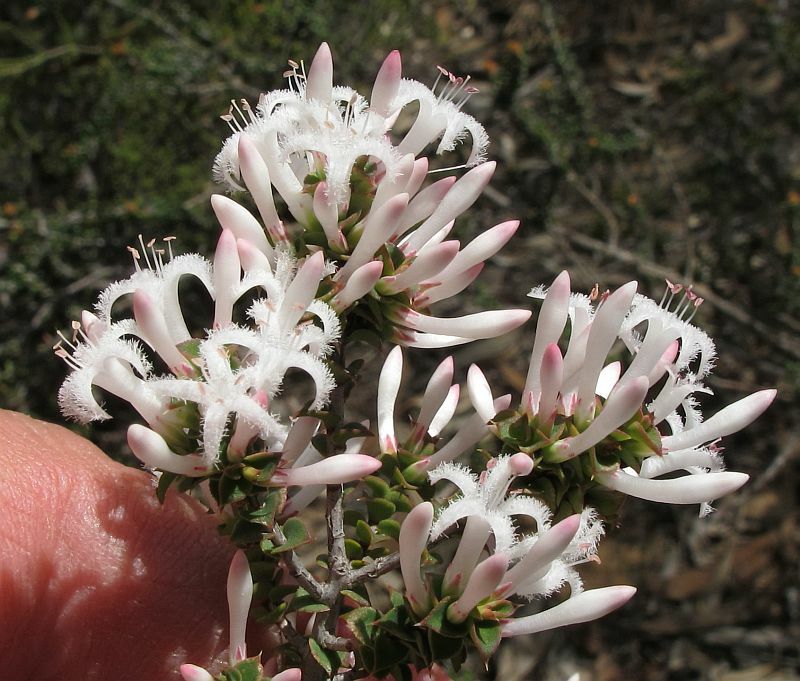 Although this species can be common in habitat (low-lying areas in fine sand/clay loam over limestone) they have a scattered distribution from the Nullarbor to just west of Ravensthorpe and then north to the Hyden and Norseman districts. 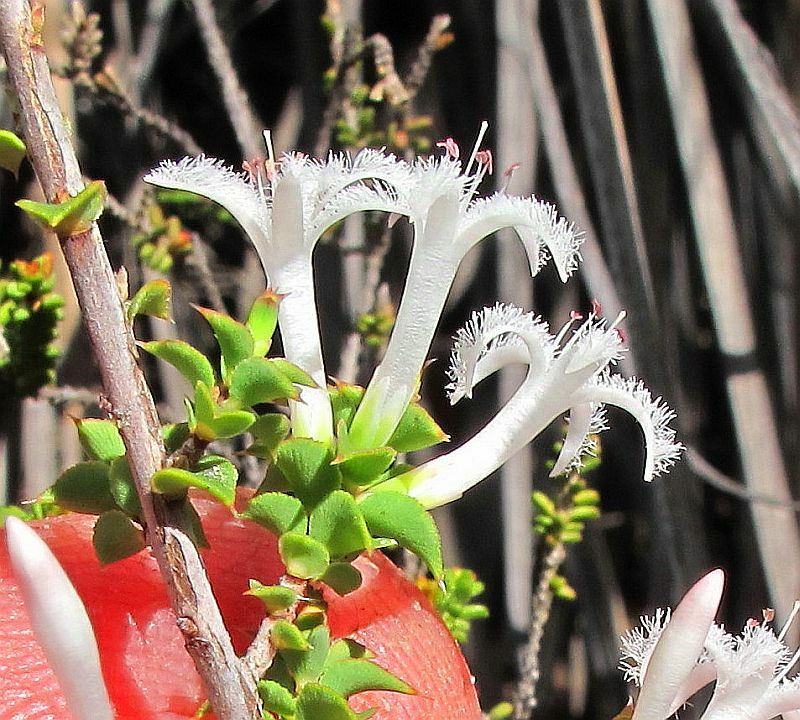 The genus Styphelia belongs to the Ericaceae family, but may also be listed under Epacridaceae depending on the classification system in use.